The Thanksgiving story is such an important part of the November holidays. 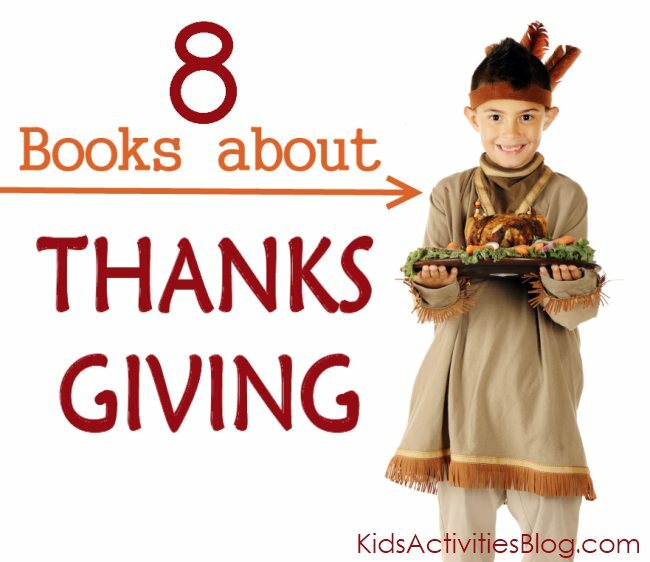 This list of great Thanksgiving books will keep your kids involved in the holiday drama. Kids Activities Blog loves reading with children…especially if it is part of the holiday celebration. Our kids love to read stories and I love helping them learn about one of my favorite holidays. We have enjoyed doing Thanksgiving activities to help us learn to a lifestyle of gratefulness. One of the character-traits that I especially want to cultivate in my children is a sense of contentment in what we have been given and gratitude for the little things around us. Hopefully, these books can help your children be more thankful. The Night before Thanksgiving, by Natasha Wing. One of our family’s favorite things to do each Thanksgiving is to bake a bunch of different pies. It is fun to read a book that has cute illustrations and mentions so many of the Thanksgiving traditions, from baking pies to watching the parades, and of course lots of family feasting. The Littlest Pilgrim, by Brandi Dougherty. I am sure my youngest children can relate with this story. They often want to “help” in the preparation of our Thanksgiving festivities – and too often they get in the way or make a mess. This is a cute book about a girl who has similar struggles and learns to have a friend through the process. Turkey Trouble, by Wendy Silvano. Ever think about Thanksgiving from the perspective of a turkey? This book is super silly. It had my kids giggling as the turkey dresses up to avoid being “caught”. It’s illustrated by one of my favorites, Lee Harper. We like his other book, Emperor’s Cool Clothes. 10 Fat Turkey’s, by Tony Johnson. This is a rendition of the 10 Little Indians, only it’s Turkeys, sitting on a fence. One thing I love about this book is that it helps early readers with repetitive words and rhyming. Thanksgiving on Thursday, by Mary Pope Osborne. We have several dozen of the Magic Treehouse series of books. They are great for kids who are just starting chapter books. This story follows Jack and Annie as they travel back and relive the first Thanksgiving. Cranberry Thanksgiving, by Wende Devlin. This is a re-release of a classic story of a Grandma and her granddaughter. Each Thanksgiving they invite someone who is lonely and/or poor over to share dinner with them. This year Grandma almost looses her secret recipe for Cranberry bread. Thanks for Thanksgiving, by Julie Markes. Being thankful for the little things is a great trait to have. This story focuses on all the blessing that we have. The pictures are great for opening discussions of the things your child is thankful for, and there are blank pages so you and your child can list the things you are thankful for. THis could be a cute tradition, to add more items you are grateful for to the book each year. If You Were at the First Thanksgiving, by Anne Kamma. Are your kids past storybooks but not quite ready for chapter books? This is a great resource non-fiction book for your shelves. It is part history book, part pretend-inspiration for a dramatic child. The book asks what your life would be like if you lives in the era of the first Thanksgiving feast. 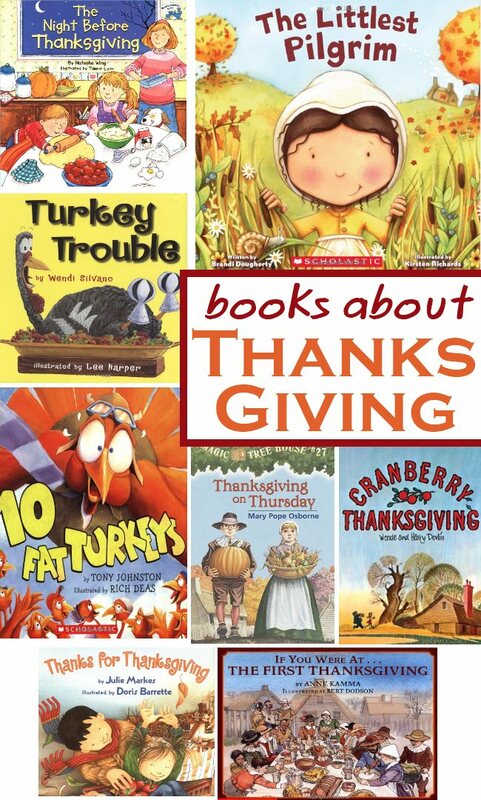 Do you have a favorite book about Thanksgiving? Love this! Such a great resource. I love your blog and it is a wonderful resource for parents & educators. I’m featuring your post in my Top 10 Thanksgiving Recipes & Crafts post. Great list! One of our favorites is One Little, Two Little, Three Little Pilgrims by B.G. Hennessy. I don’t think I’ve even read any of these books myself … we’ll be hitting the library! I now know giving up smoking is almost impossible. I started tobacco while I was really young. It absolutely was the worst wrong move Ive made. Right now 20 years later and I have emphysema. I experimented with a pile of the quit smoking methods however not one thing helped me. My last hope is a electric cigarettes in the end. Th is is fascinating. Appears to be like some ripped graphics from the W isconsin logo.